1. Ashley for her super cute redo of a tote bag printed w/ a school logo on it. 2. Molly for her compiled list of tips on saving money on grocery shopping. What an incredible resource! 3. Heather at Apples On A Stick for her cute cookie cutter potato stamps. What a fun arts & crafts activity for any little kid. 1. If you get tagged, write a post with links to 3 blogs that also have great tips. 2. Link this post so that people can easily find the exact origin of the meme. 3. 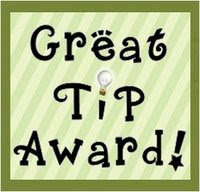 Optional: Proudly display the 'Great Tip Award' with a link to the post that you wrote. 4. Optional: Submit the tip(s) to be featured on TipJunkie.com. Aw! Thanks! You made me smile today. Your blog is seriously the most wonderful ever. I get SO many ideas from you. What other blogs do you recommend as your favorites with good advice, ideas, crafts, and activities? I'm sure there's tons, but a few of your favorites would be great. 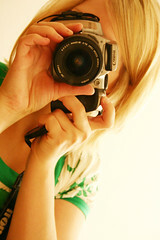 I love your blogs..P.S the apron pic is up!!! I enjoyed reading this. I read over the grocery ideas... what do you think about cooking 5 lbs of ground beef at once, freezing it and using it as you need it? Does it change the taste a lot? I don't know Michelle. I've never done that. I have bought my ground beef 5 lbs. at a time & then divided it up into 1 lbs. ziploc bags & frozen it that way. But I always defrost it & cook it for each meal. We don't use ground beef nearly as much as we used to, but I do the same freezing thing when fresh chicken is on sale. i am so honored!!! i will post for this soon, promise! claire look so so so good! chubbin up quite nicley! she is a cutie! You totally deserve this award! you're blog gives me a lot of inspiration and I enjoy looking at it. Thanks!